How can I determine this from windows, osx and linux? SMBIOS Version is 3.0 according to wmic and uefi shell. I guess its too low level to be seen by the OS? Edited by ndog37, 05 April 2018 - 12:29 AM. I don't think it is too "low-level", most probably none of the geniuses at Intel and MS thought it was useful and didn't provide a "handle" or "hook" to get it. 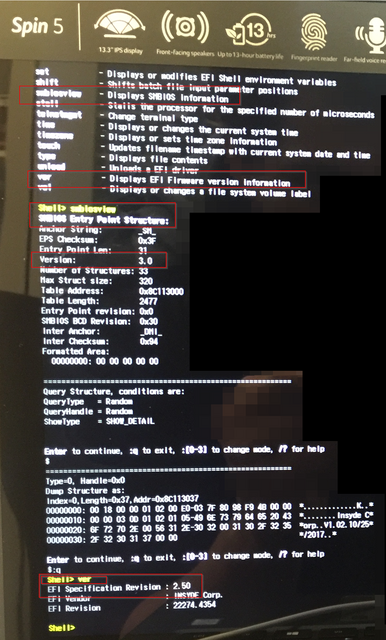 The number that you are looking for and obtain with "ver" in the UEFI shell has seemingly nothing to do with the "version" that you can get via WMIC or similar, basically because (as per your screenshot) it is NOT called "version" but rather "EFI Specification Revision" (aptly called in the above official link "UEFI specification version". I expected that Windows Management Instrumentation had a field for that (at least on 8 and/or 10), but evidently there isnt one. should list all variables available, but then most will need to be "decoded" in human readable form.